This entry was posted on Wednesday, February 6th, 2013 at 9:24 am and is filed under Off-Grid. You can follow any responses to this entry through the RSS 2.0 feed. You can leave a response, or trackback from your own site. Sterling logo. I would go one better, though, and 14kt it. Winter logo with snow, bare limbs, and sap buckets. Summer logo as is, no buckets, but with chickens or garden? Summer pic with winter adornment confusing. Great looking overall. Want to design one for us? I think more potholes would explain the name more. How about one tree has fruit and the other is a maple? I agree…livestock of some sort. Honeybees on flowers? I like its simplicity, clean, and off the grid appeal. It reminds me of yesteryear charm and the school books of maybe 40-50 years ago. 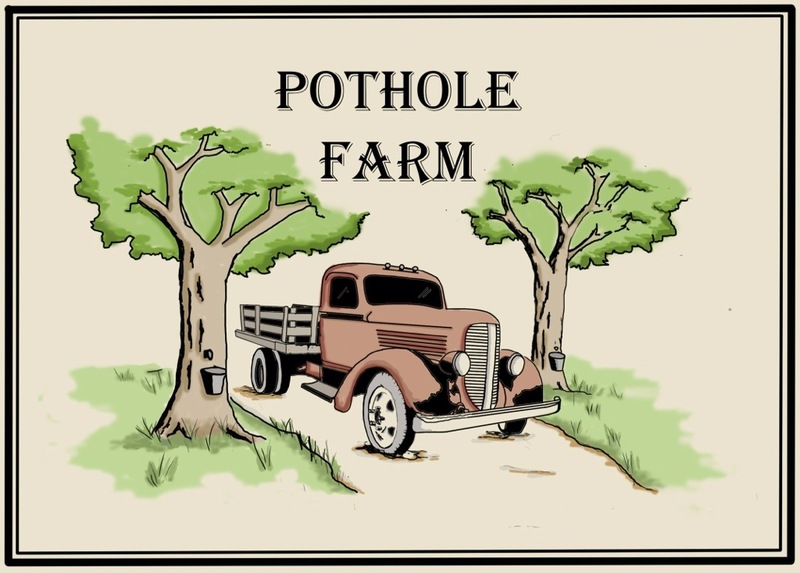 I like it; however, I don’t know the meaning of your farm’s name – why you named it Pothole farm? I would love to know the origin of the name. At first we tried to come up with a typical name like Windswept Farm or Tranquility Farm, but Sonny and I are not typical. We live off a gravel road and although the state maintains it, it is always full of pot holes. We live at the end of the holler and to come see us you must run the gauntlet of pot holes. It is like going back in time. I can imagine years gone by when the ruts left by wagon wheels would have run the length of road back to our farm. So I think it fits us perfectly. Thanks for asking. Yes, it is a good name that fits well, and very creative. I nominated your blog for a Liebster Award. Check out my post: http://maplecreekcottage.wordpress.com/2013/02/18/just-when-you-thought-no-one-was-reading/ for the details, if you want to accept!